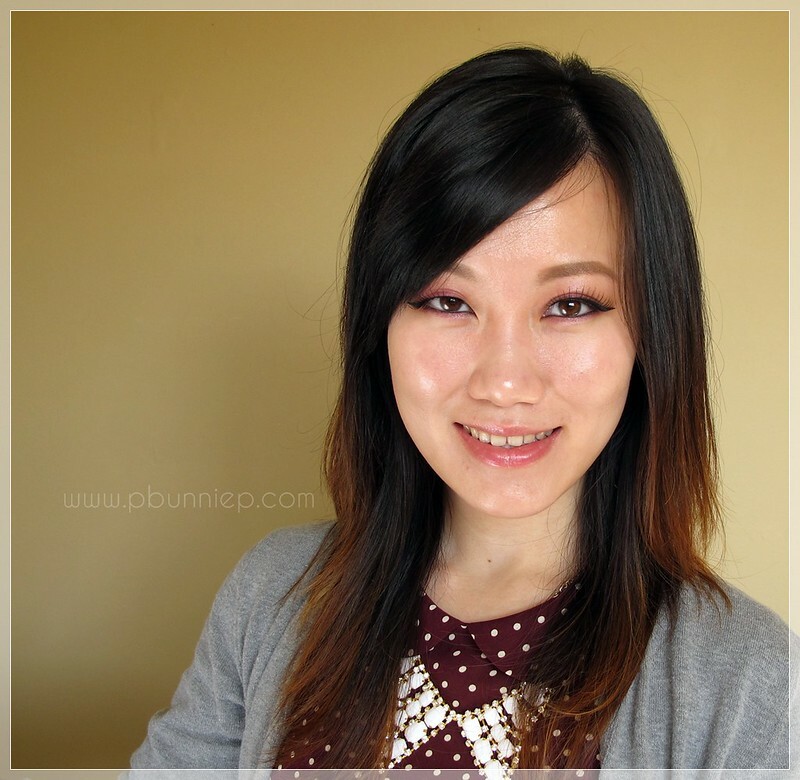 TheBunnieHole | Vancouver Youtuber & Blogger: Review: MIZON | Snail Repair BB Cream | Best foundie of 2012! 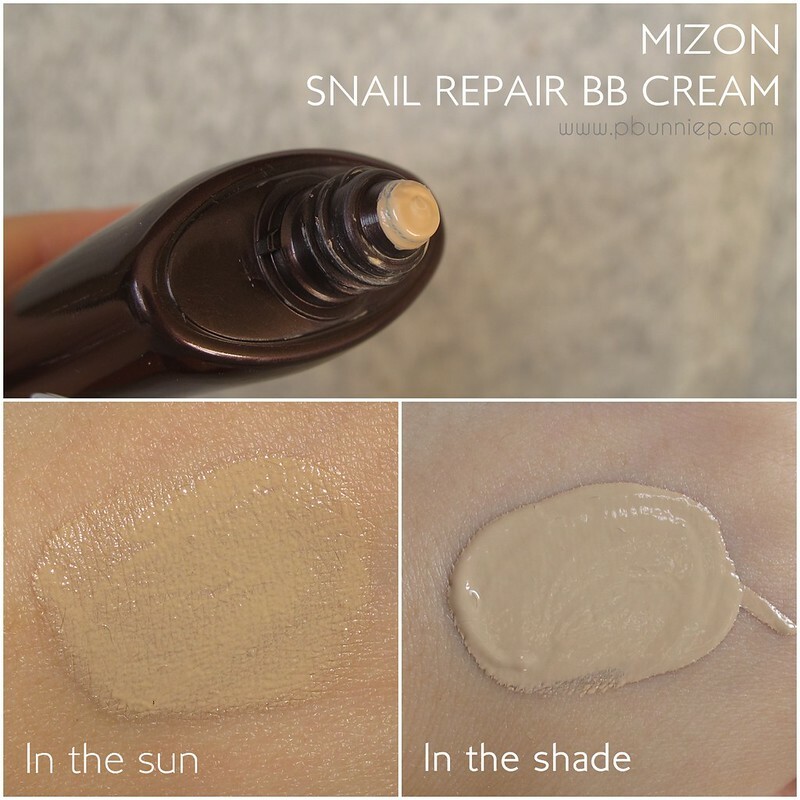 Review: MIZON | Snail Repair BB Cream | Best foundie of 2012! Sometimes taking risks brings you great and wonderful things, in this case I've found a BB cream that I am crowning the best foundation/base discovery of the year. 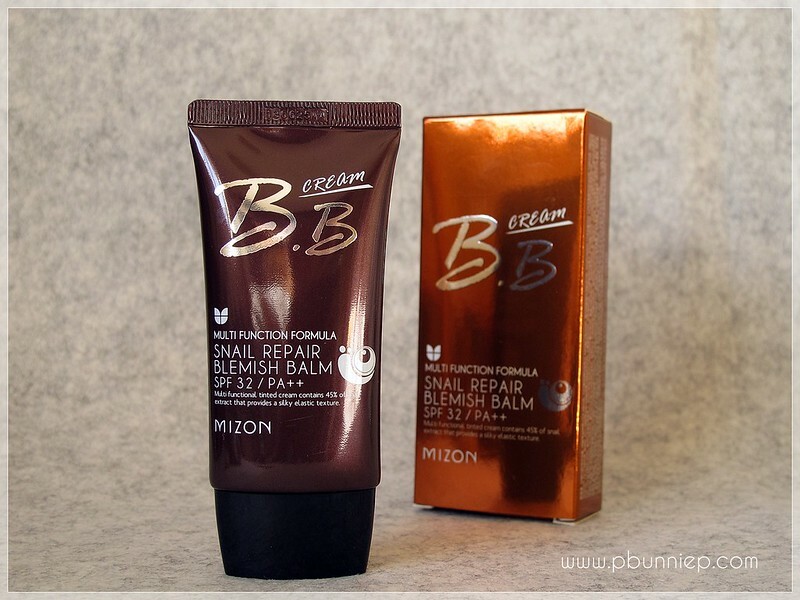 If you've been hearing me drop hints about it here and there, well...here's a full on photo heavy post all about the MIZON Multi-Function Snail Repair BB Cream. Funny story, I knew nothing about the brand or this bb cream when I jumped in and clicked the "purchase" button on eBay. Even Google came out blank on this one save for a few Naver posts in Korean. Thank goodness this bb cream turned out to be awesome and so to express my thanks to the beauty gods for this good fortune, I'm here to pass on this gem to you! As this doesn't seem to be a very well known product internationally, there's only a small handful of sellers that carry it through eBay for world wide shipping. I've yet to see it anywhere else. I must step in here and say that this bb cream has the best shade match for me that I have (possibly) ever encountered and is a very close match to my skin even without blending as you can see in my photos. It doesn't have too much pigment so it's not too yellow but enough so that I don't turn out pink. I'd say it's more of a light yellow beige on the colour chart. The SPF inside may not turn out the best in flash photography but honestly I can't stand flash photos outside a studio setting to begin with. Here's a quick look at it worn by itself (no concealer/powder). I took my photos on a cloudy type of day (the sun couldn't make up its mind) so my "after" shot turned out a little cooler in tone than it should be. In real life, the overall shade was very neutral. Another photo with a full faced makeup shot, which was a good 4-5 hours after initial application hence the oils have started to show but this bb cream does powder down very well meaning that it doesn't cake up or get patchy so touching up is easy. Oh and yes I do have a reflector on me in this photo. A true blend between a foundation and BB cream, covers and heals! Thin, blendable consistency but in high coverage (medium - full) with a lovely glow and good adhesion. Heals the skin: knocks out redness, reduces spots/blemishes and increases skin elasticity when worn regularly. Recommended for: Mild - dry climates, "semi-oily/normal/semi-dry/dry" skin types, those with blemishes, large pores or slightly mature skin. Things to note: This isn't sweat proof, water proof or bullet proof so it won't last you through a hot steamy day (or night, ahem). It will wipe off once it gets wet or when your natural facial oils come through again. Minimize this by using a primer and setting this with a powder. When touching up, blot your face gently to avoid disturbing the base, mix a little moisturizer with this bb cream, reapply and powder again. Overall this is an excellent all around hard working product that truly doubles as both a cover up and a skincare and it works wonderfully as both. No longer do I have to choose between one or the other, my daily routine has gotten so much easier with this in my life. It might have to take a winter break because I've got a feeling it's not quite rich enough for the windy Canadian winter but it's definitely earned itself a permanent spot in my makeup box. Have you tried anything "snail" before? Wow really wonderful review~~ It´s the first time than i see this brand! 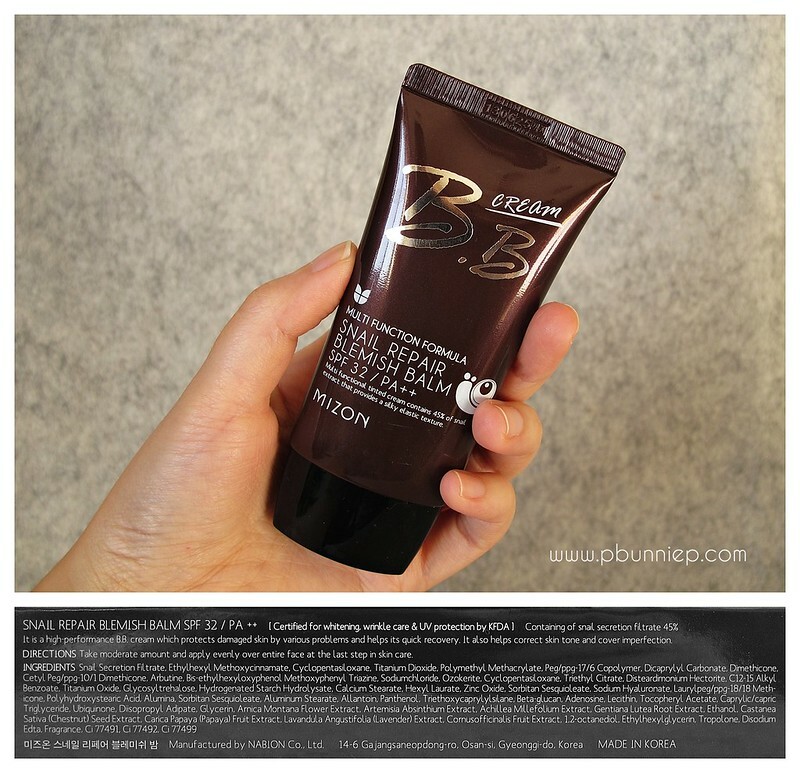 I never try this BB Cream before :) Thanks for sharing! have you tried other snail bb creams? Not yet but this definitely has me more excited about them in the future. I might go and try out the Mizon snail cream/moisturizer next though. Thank you! I'm rocking red...well "cranberry" eyeshadow for the first time. It's the one I got from my MUA HAUL. This sounds great! Just wondering, how does this hold up against the Hada Labo BB moist cream? It's my current HG and I noticed you really seemed to like it in the past :) Great review on this! I'd say the Hadalabo is still more moisturizing than this Mizon one and would make a better option for winter. It feels slightly thicker on the skin and doesn't spread as thin as the Mizon. Plus it has a light-medium coverage only and doesn't have much skin 'healing' benefits. Still great though, I just use it for different occasions. I want to try this out SO bad but I know the color won't be fair enough for my uber pale skin :( Boo!!! You're skin looks fab btw!! Amazing review as always love! I was actually thinking about you as I wrote this because I knew you were interested in this. Are you in the same "paleness" level as Suzy? I'm a NW 25 in Mac, do you think this would work for my skin tone? I so want to try but kind of afraid that it will make me look like a ghost. I think it may be just a touch too pale. But since it's so close, you may want to just mix it with a drop of darker/normal foundation and it should work fine. Thanks for the review! I love how detailed your reviews are, and how you don't spend time talking about things that are obvious/irrelevant but instead you focus on the things that I find very useful- ingredients, explanations of what those ingredients do, how it compares to other products, and your pros/cons are always thoughtful. I'm using Missha #13 as my winter shade, do you think this one would be too pale? If this wears nicely under power, I could lighten it that way, but I have no idea what powders suit BB creams ... halp? It does have a scent and it's something that smells familiar yet I can't remember what it's comparable to (it's actually one of the things that bugs me because I keep wanting to remember it) but I'm quite certain it's not mothballs, lol. From the swatches I've seen online (since I don't own the Missha) I think the Mizon might be a smudge darker or just the same as the Missha but definitely not lighter. Altogether though, I'm not a huge fan of powders at all. If it's just a little darker, that should work. Lemming intensified! Should match my skin color too. Anyway, I know a website where u can buy it around the price you mentioned above. There are a lot of other Mizon products too and a brief description of the brand. Just came back from Korea and bought this BB Cream. Due to end year sale I guess, they offer Buy 1 free 1. So lucky. Have u try Snail Collagen - Total Care Cream from Dr. Post. Hi, I just discovered your blog....love it! I love these kinds of reviews because you actually take the time to research each product and give your honest in depth opinion on them. I just discovered BB creams. I was initially thinking about buying the Loreal youth code bb cream since I liked there SPF Day Lotion until I discovered that the ingredients didn't match the benefits that it claimed (on the box) & the reviews weren't so great. I then googled bb creams & discovered the Korean ones & realized the ingredients were above most of the US ones. My Question: I narrowed it down to the Mizon BB Cream & Skin 79 VIP Gold. Both seem great, but if you had to choose just one, which one would you grab & never let go? I have oily t-zone skin, dry on some areas, but mostly oily & prone to breakouts if my pores clog (like coconut oil is horrible to me externally). Do you know if these products clog pores? Also, I have some old acne scares & wonder which of the two would be best for this. Thanks kindly! Keep up the wonderful job! I actually have the L'Oreal Youth Code and out of the Western Brand BB Creams I've tested, it's actually not too bad (I'm planning to review it soon). I tend to use the Skin79 one during the wintertime and the Mizon would be better for me in the summer actually. But since you said you do have oily/acne skin, then I'd definitely say give the Mizon one a try. 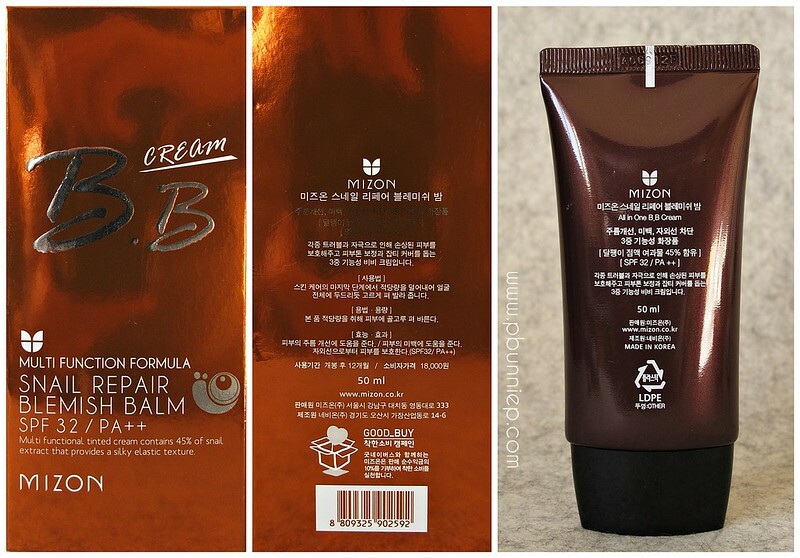 I've never had breakouts with either product (and of course everyone's skin reacts different to ingredients) but the texture of the Mizon bb cream and the coverage would likely suit your skin type better. Hi Frances, welcome to my blog! I've only tried one "snail" product so far and this was totally just by curiosity (I only researched more about it after seeing it's good effects) so I guess you can say it was a lucky shot! Have you seen the new Skin79 Chiffon/mousse BB? Hi there! I just discovered your wonderful blog/YT channel. Love your really in-depth reviews with great photos. I was wondering if you might help me to determine if this BB cream would be too light for my skin using the links to 3 photos of myself from below? Thanks so much! I can't wait to try my first BB cream. I think it may be just right or at least very close. The BB creams applies a tad lighter initially but settles seamlessly after a few minutes. Do you know your shade in any other base products? I have a full list of my foundation matches if you go to the top of the page and click the "My Stats" tab if that helps further. Good luck! What do you suggest using bb cream for extremely oily and acne prone skin? I have both and I can't stand wearing lots of make up. I just want something simple where it does both for me. Please help me! Hi Yasmine, I wouldn't suggest this for extremely oily skin but its great for acne prone skin. Would you recommend this to someone who is inbetween NC20 and NC25? I might be just a tad light but mix a tiny dab of darker foundation with it and you should be good to go. Or just warm up the skin with a slightly darker powder. I was wondering, is this to dark for someone NW10/NW15? And is this a thick or thin foundation, consistency wise? This might be a tad dark for you and it might be a bit too warm if you have a cool skin tone. 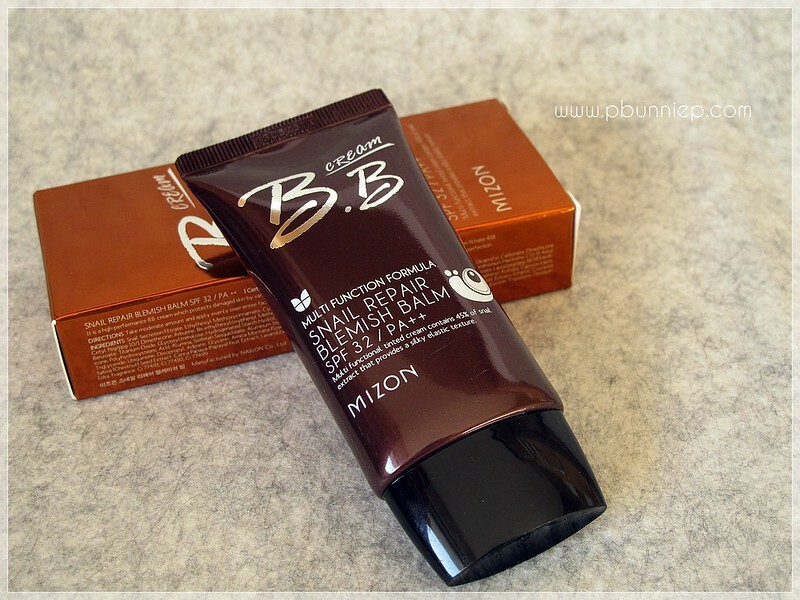 As for the consistency of this bb cream, like I've mentioned in my review, it is a very thin but creamy consistency. So compare this to a creamy lotion rather than a thick moisturizer. I ordered this on ebay and in the title it said 50 ml but later I read the description and it said it was a travel size. Do you know by any chance if this does come in a travel size because I couldn't find it anywhere and I'm worried it might be fake :S I don't know what to expect.Thanks! I don't believe it comes in a travel size, perhaps they have "sample" sizes for testing but the full sized item is 50ml (and that's what I have). The numbers on the tube say "130625" on the front and "A06912F" on the back, neither of which looks like an expiration date, not to mention that most Korean products usually list manufacture date rather than expiry date. If you ever need to take a closer look at any of my photographs in the futures, click on it and it's expandable on flickr. Yes, most Asian bb creams do tend to fall on the lighter end of the colour spectrum, likely to better suit the majority of the demographic there. There are a few brands that offer slightly more shade variation: Etude House Precious Mineral "Bright Fit", Missha Perfect Cover BB comes to mind first. Lioele's Triple the Solution BB comes in only one shade but it's a pretty dark one compared to its Korean equivalents. All three are quite decent in coverage, medium/buildable. Western brands offer more shade selection generally speaking. MUA's BB Cream goes pretty dark but lacks in true skincare benefits, more of a high coverage foundation I would say. But as a whole, I have yet to try a Western brand BB with superior coverage and skincare functions. I don't see why not, I mix base products all the time. did u buy mizon`s product from their website or on ebay? if on ebay can u give the name of seller u buy mizon cos i am afraid i can buy fake. I bought mine from eBay (I think the Mizon website only ships in Korea/Asia) but since it was a long time ago, I'm afraid I don't remember the exact seller I bought it from. However, I was just browsing some products online a few days ago and I think F2PLUS1 currently carries it in their shop...I've been shopping from them pretty frequently lately and everything has always gone well. Hi thereis website called www.testerkorea.com and they carry Mizon products if you would like to try. Very good blog, informative videos. Hi! I have been following your youtube channel on/off and I have to say that I totally enjoy and appreciate your reviews! I saw this review and now I am hesitant to purchase a "snail" product but have heard from other bloggers that snail products function great. I've never tried any Mizon base products before and wanted to ask if you have tried the Mizon Correct Combo cream yet? Does it compare at all to this BB cream? I know that it is more like asking the difference between apples and oranges but Mizon products sound awesome and I want to try them so badly! At this point I want to purchase this and the Correct Combo but then my bb/cc cream collection is growing at an alarming rate!!!! I haven't given it the full run down yet, the Mizon CC Cream was released with a toner/mist product that I had been waiting to get my hands one before trying them out together. I did do a swatch of the Mizon CC and I'd say it's definitely less coverage than the Snail Repair and it feels slightly heavier on the skin. I have been using their Snail Repair Ampoule and it's quite decent as well, seems to help clear up my skin without irritation though I'm not sure if it's a HG product yet. Still though, they have quite a few interesting things in terms of skincare etc. I'd say between the BB and the CC, I'd probably go for the BB cream first and see if you like it...it's also the cheaper option of the two just to try out the brand. Hi there! I'm a new follower to your blog/channel and wanted to thank you for introducing me to this product. I have a quick question about using this BB cream: do you apply a moisturizer underneath this product? Or apply it directly to your bare face? I'm also a little worried about using a primer because I don't want to interfere with the penetration of the product. I'm still pretty new to using BB creams, so I was wondering if you have any advice on just the basics of using it. Thanks so much! I feel like it depends on your habits and skin type...most of the times I always apply moisturizer underneath because I feel like it helps my bb cream blend better. I've seen the Secret Key snail products online as well but many of their formulations seem to contain mineral oil so I passed on it. Thanks for the thorough review, I'm intrigued! I've been a pretty devoted Missha Signature user all this time but this sounds interesting. FYI this seems to be catching on--I've seen this Mizon bb cream pop up on Amazon more often nowadays (I put this item on my "wish list". I've personally never had a bad experience with buying my Missha bb cream on Amazon so hope the same would be true here if I try this).